This entry was posted on Wednesday, April 3rd, 2019 at 7:08 pm and is filed under Diving Log 6.0. You can follow any responses to this entry through the RSS 2.0 feed. You can skip to the end and leave a response. Pinging is currently not allowed. This post found me on Bonaire after a couple of nice dives off Klein Bonaire this morning. I have a Suunto Eon Core. 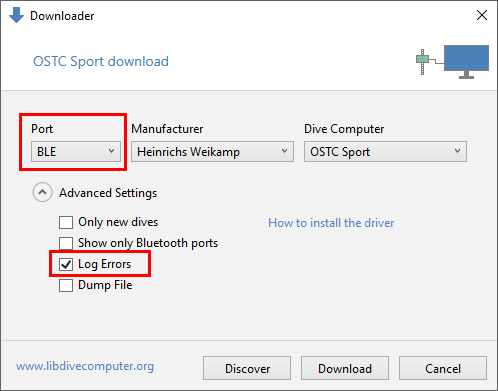 On the first try I was able to download some dives but not all, however, I forgot to enable error logging that try. Since then I can’t get any dives to download. The only thing on the Core I’m seeing to enable Bluetooth is General, Connectivity, set Airplane Mode to Off. I then go to Downloader, set to BLE, then click Discover. Under Searching Bluetooth LE Devices a line with the Core’s serial, followed by what I guess is a bluetooth address, appears. That soon is replaced by a line which has the bluetooth address to begin: 0c:8c:dc:21:5e. If I click OK to that, the download attempts, and fails. It will be great if this can be made to work! 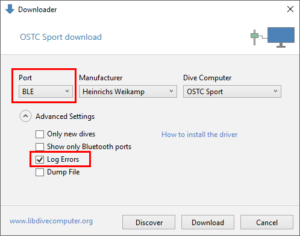 If a dive computer is paired to your PC, you can click directly on “Download”, not “Discover” which is only needed for unpaired devices. I think I know why it worked the first time. Both computers were probably not paired and the pairing forced the connection. I’ve now changed a few things and hopefully it will now connect to paired devices as well. Are you still wanting feedback on this? Yes, the zip file above has been updated already several times based on feedback. The Shearwater and HeinrichsWeikamp downloader should work now reliable, if you have the Sport Matrix or G2 let me know (I’ll have a new update coming). I have Shearwater. I’ll still give it a try though, to confirm. I downloaded the beta support for BLE and tested with my Shearwater Predix AI dive computer on a Windows-10 laptop. I was able to download all 90 dives without issues. At quick glance looks like all data has downloaded correctly. Now I can download directly with DL6 and no longer have to route the downloads via Shearwater Desktop, which was quite awkward. Great to see that your are working on Bluetooth LE. I would be happy to help your debug a Mares Dive Link if you get round to adding this device. Mares’s own software doesn’t support it yet which is extremely frustrating. Yes, Mares BLE support is now in libdivecomputer and I can add this to Diving Log. Please stay tuned for an update. Thanks, I saw that a new .c was added for the Mares 2 days ago :-). I am looking forward to the update and would be happy to help with testing if necessary. I will watch the site and wait for your notification. Please provide any feedback via email and include the “Error Log”.